Do you love art and design? Then you will definitely love Liège. Liège is located in Eastern Belgium, not far away from the Netherlands, Germany and Luxembourg. The river Maas flowing through the city and its beautiful buildings – like the famous Liège Guillemins railway station for example – make Liège really worth a visit. Maybe you are even moving to Liège! With removal company Henneken, your removal to Liège is in safe hands. Removal company Henneken was founded in 1870, which includes that our experience with moving people and companies is really extensive. 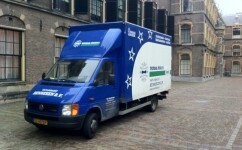 Did you know that we perform about 300 removals from the UK to the Netherlands or Belgium each year? With reliable equipment, a modern fleet and – last, but not least – experienced and qualified removers, we turn every removal to Liège into a pleasant experience. Convince yourself and discover why both people and companies prefer Henneken to other removal companies! Moving people and companies has been our passion for 150 years now. Thanks to our great removal service, Henneken is involved in about 300 removals each year between the UK or Ireland and the Netherlands or Belgium. Do you want to comfort yourself when moving to Liège? Experience our excellent service level and benefit from services like handyman service, storage service and more! Comfortably moving to Liège? Request our removal checklist! Would you love moving to Liège as comfortable as possible? Then you’d better request our removal checklist! In this checklist, we share useful removal tips based on our 150 year removal experience. Since a good preparation of your removal to Liège is half the battle, we love to ease your removal by letting you benefit from our extensive removal experience. Please feel free to contact us in order to request our removal checklist! Save money with groupage shipment when moving to Liège! Some people are moving to Liège only for a year. These people often have only a few things that have to be shipped. Do you recognize yourself in these people? Then you might have thought about groupage shipment already. Groupage shipment is a great solution to get your objects shipped to Liège and to save money! In case you have any question about groupage shipment, please feel free either to contact us or to request a removal quote! How can we help you moving to Liège? Please let us know! Do you want to know how we can help you moving to Liège? Do you have any questions? Please do not hesitate to contact us! You can call us (+31 (0)79 – 361 13 68), send us an e-mail (sales@hennekenremovals.co.uk) or request a removal quote which you will receive from us within two days after requesting it. Do you prefer a free pre-move survey visit by one of our surveyors right away? Please do not hesitate to contact us in order to make an appointment. Our removal company is pleased to help you!